Chamonix-Valley-Transfers.co.uk are an airport transfer company based in Chamonix Mont-Blanc. 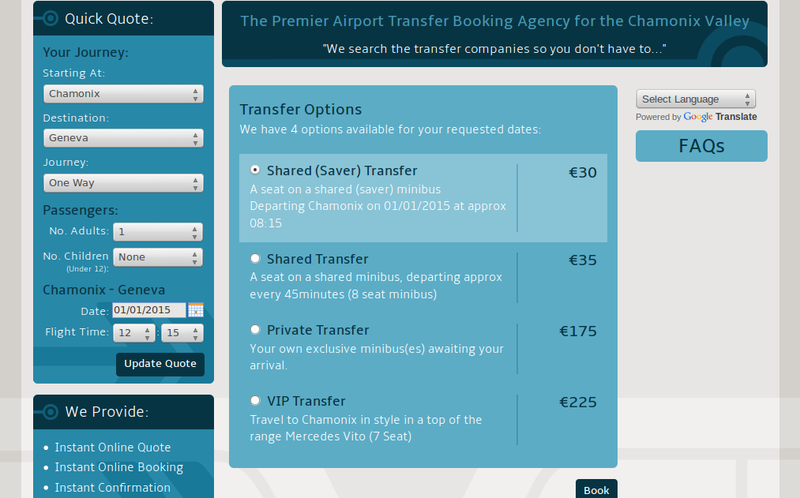 They needed a website where people could book their transfers and a CMS where they could keep track of their schedule. There is a three stage booking process, the first stage collects just enough information to give the user a quote for their transfer(s). It was decided to only require the minimum information, the form even builds itself as you go so as no to overwhelm the user with many input fields. Stage two gives the user a list of transfer options and stage three collects their personal details. Once the transfer is booked it is entered into the database and also added to a shared Google Calendar that is used by the drivers. All the transfer prices and transfer availability is also hadled by the CMS. The website has recently been updated to interface with their partner website ChamonixAllYear.com so all bookings are also submitted to the ChamonixAllYear bookings system, it also uses a PayBox payment gateway.